Exterior view of Atlantic 2. Our plants and landscaping are all native plants and drought resistant. Come upstairs to Atlantic 2! Covered porch at Atlantic 2. Great views from here! View of the beach from Atlantic 2. Path to the beach from Atlantic 2. Beach in front of Atlantic 2. A very short walk down the beach path and you are here! 'Private beach' seating in the backyard of Atlantic 2. 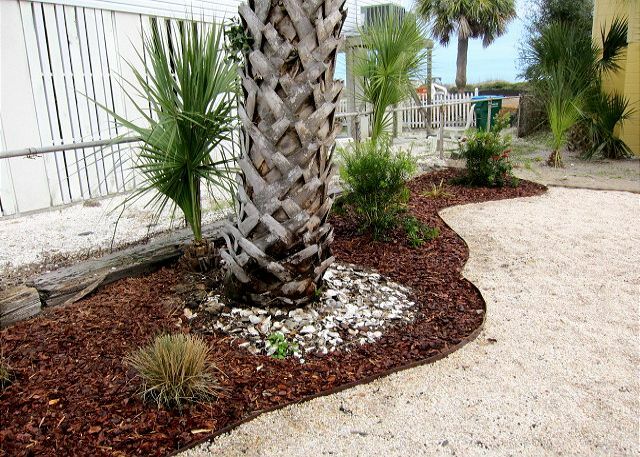 Cottage is dog friendly, but the yard is not fenced (and remember, no dogs on the beach!). The amazing screened in porch at Atlantic 2. Be here now. 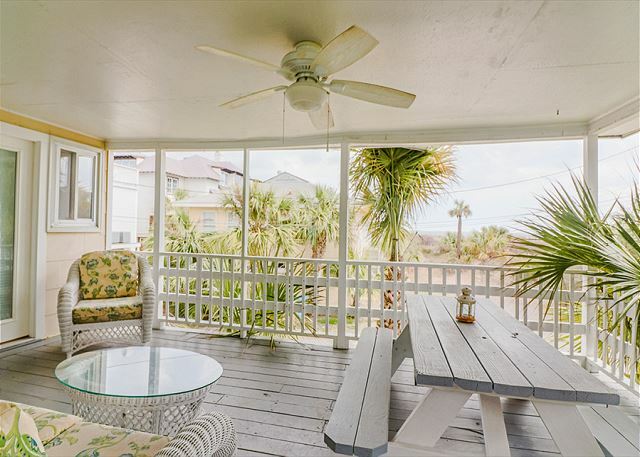 Screened in porch has the perfect view of the beach! So close... and yet not too close. The view is perfect. Wish you were here! The screened in porch will be like another room for your stay. The best room in the house! The balcony from Surf's Up bedroom. Sit here and say "Hey, y'all, I'm at the beach!" Balcony overlooking a porch? Yes please! Crabby Jo's Cottage by Fifi Flowers. 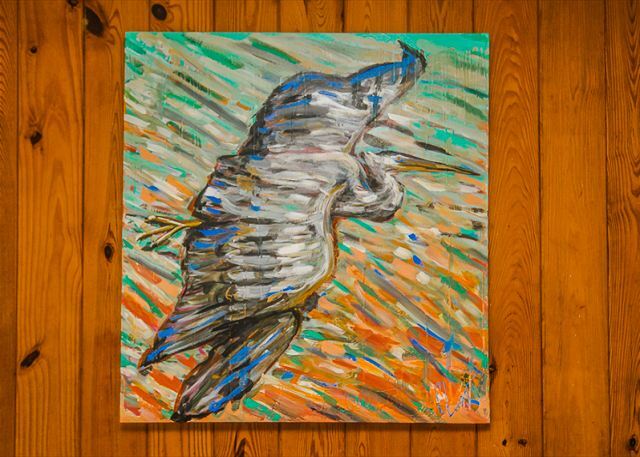 Matted prints sold at Seaside Sisters gift shop on Tybee Island! 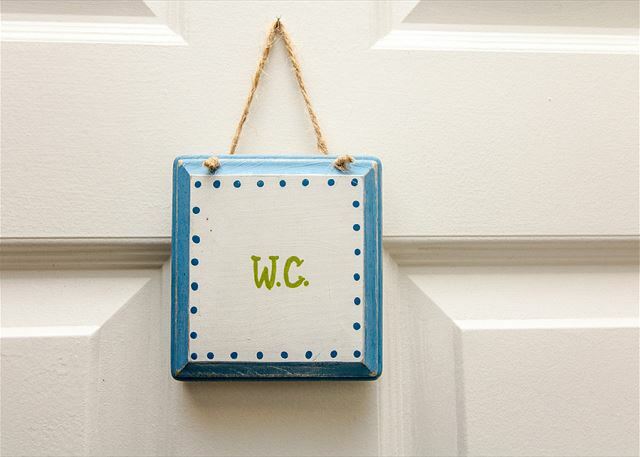 Be sure and take one home; great souvenir of your stay! Atlantic 2 - a great place to relax and enjoy a good book! Do you think she's reading a little Mary Kay Andrews?? 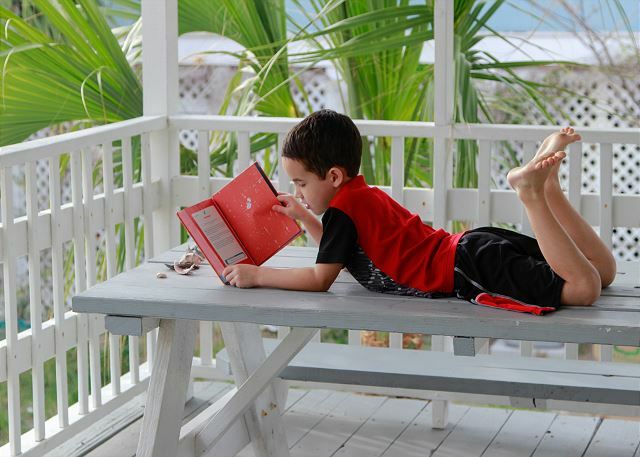 Atlantic 2 - a great place to relax and enjoy a good book and bond with your family! Atlantic 2 comfy living room. 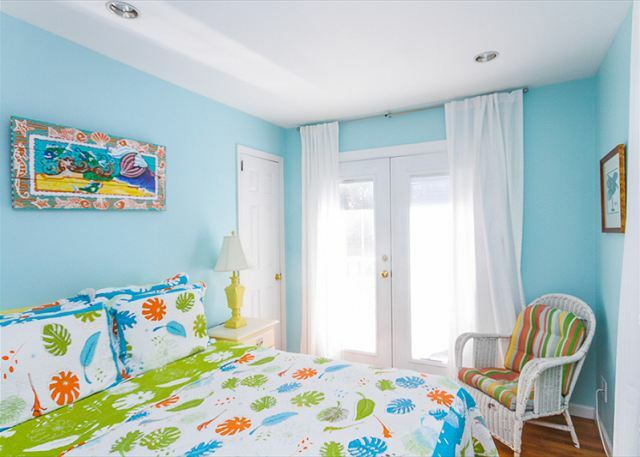 Directly behind Atlantic 1, you can have the two most beachy vintage cottages on the island! Come and sit here. Relax. Enjoy your time watching TV, but who can do that with the ocean so ... right there!!?? Sit. You're just steps from the ocean. 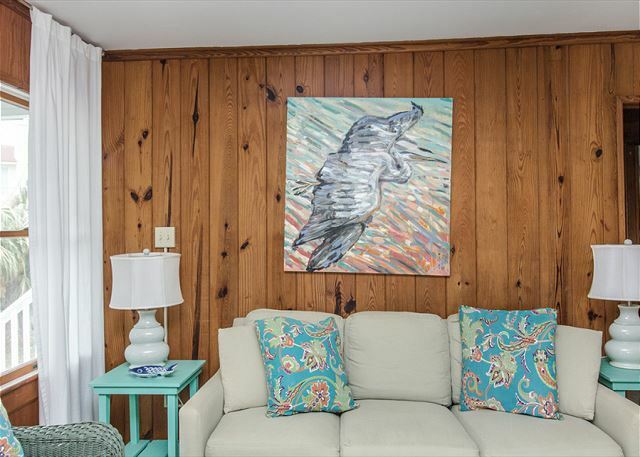 Local artwork makes this home just wonderful. Open and spacious kitchen for your stay. All you need is included just bring your wine... I mean food! Dining room in the open floor plan space. 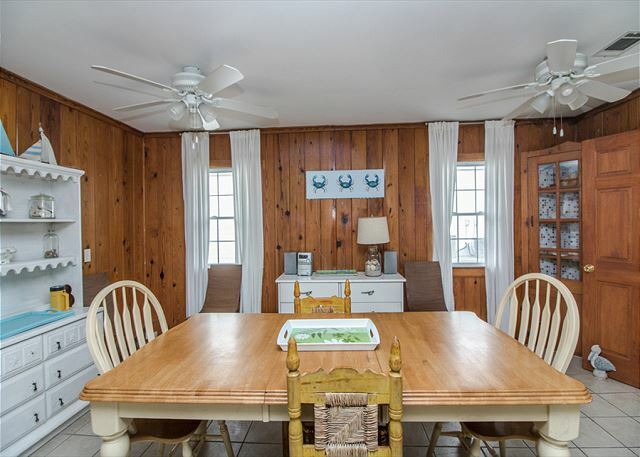 Enjoy dining or cards or just open a window and listen to the ocean. Because you can! Open living and dining room plans. Original heart of pine walls. 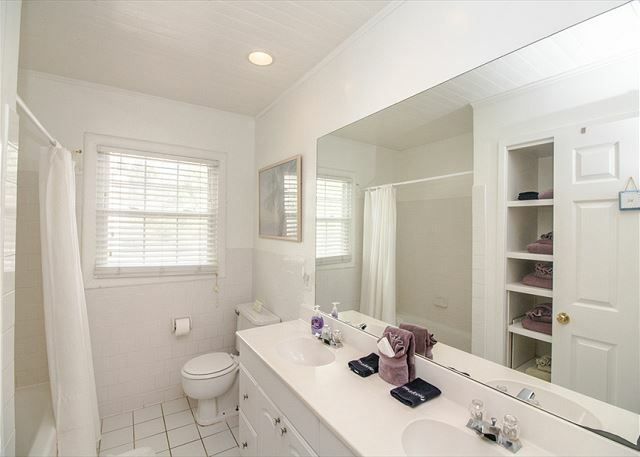 These walls were a classic in the 1930s Southern beach home. Kitchen... with this amazing view! You'll WANT to spend some time cooking and cleaning up! Amazing view and kitchen opens to wraparound porch. Open and generous kitchen with an amazing view. 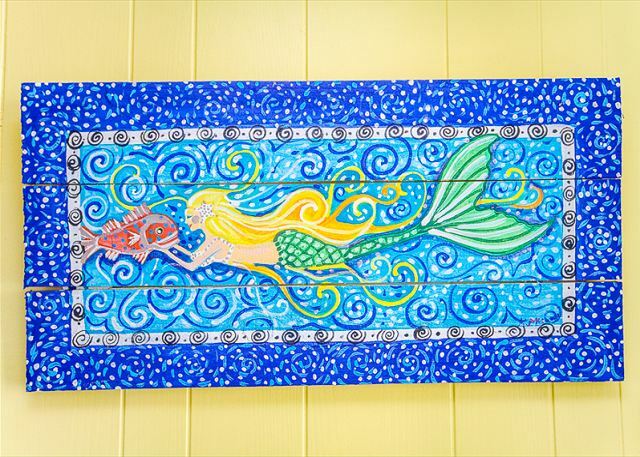 Mermaid wall art in kitchen. Queen bedroom #1. 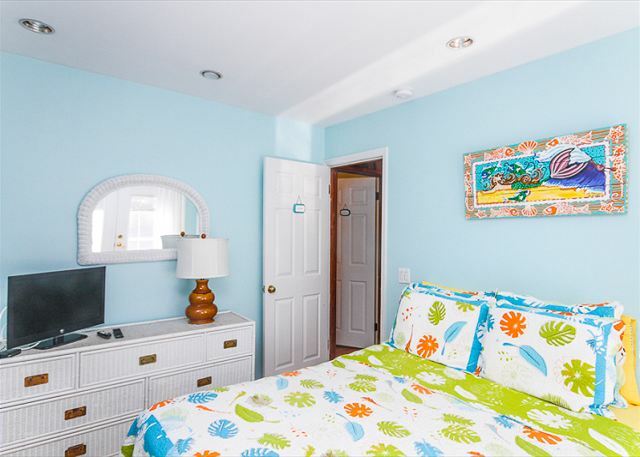 TVs and comfy beds will make you want to stay, until the ocean calls! You're turtley going to love Atlantic 2. Queen bedroom #1. Plenty of dresser and closet space for you to be home. The Palm bedroom. Double twin beds. Double twin beds. Over the almost 100 years, a lot of secrets have been told in this room! 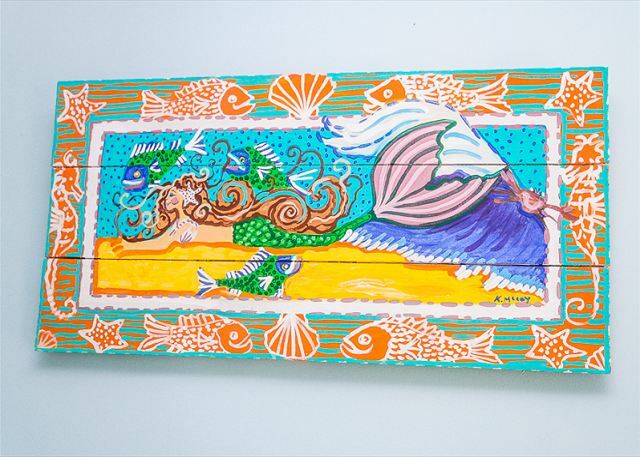 Mermaid wall art in Bedroom #2. Surf's Up queen bedroom #2. Private balcony. You'll hear all the waves from here! Bedroom #2 - Queen size bed. 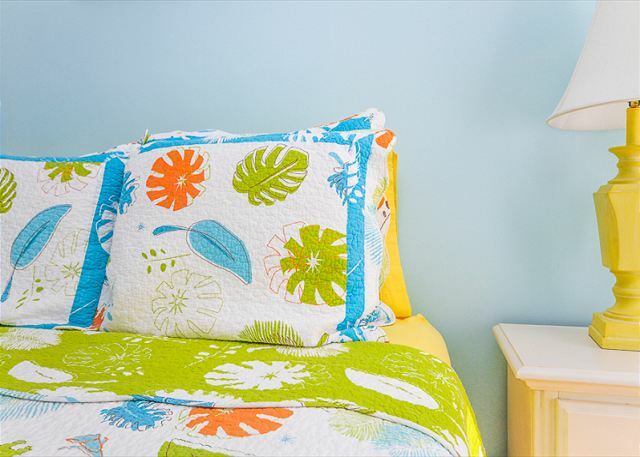 Blue with beach-themed decor! 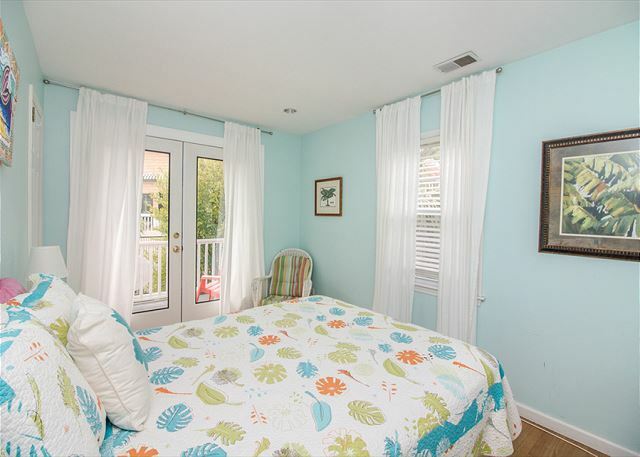 French doors open onto balcony from this bedroom. Bedroom #2 opens to balcony. Balcony off of Bedroom #2. Who needs Romeo when you've got your own balcony on the beach? 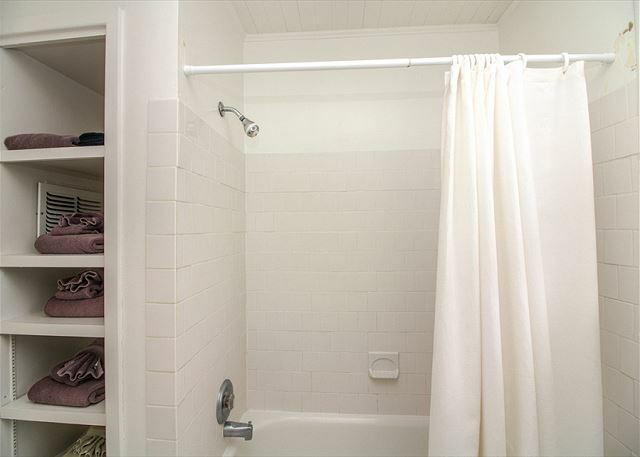 The downstairs shower/bath/laundry area. 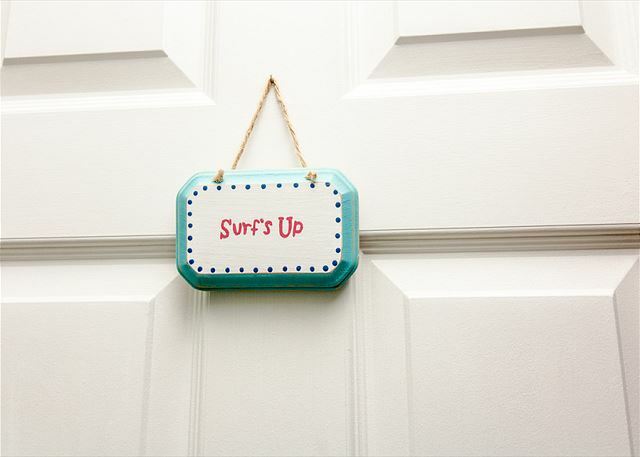 Fun, beach quotes and bright colors throughout this area. Perfect place for washing off the beach sand before heading indoors! Another view of downstairs shower/bath/laundry area. 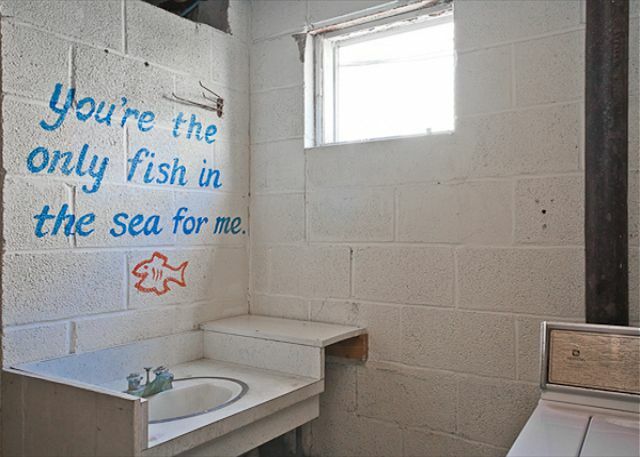 Fun beach quotes and beach paintings for the downstairs bathroom and shower areas. This incredible beach cottage is one home back from the ocean. 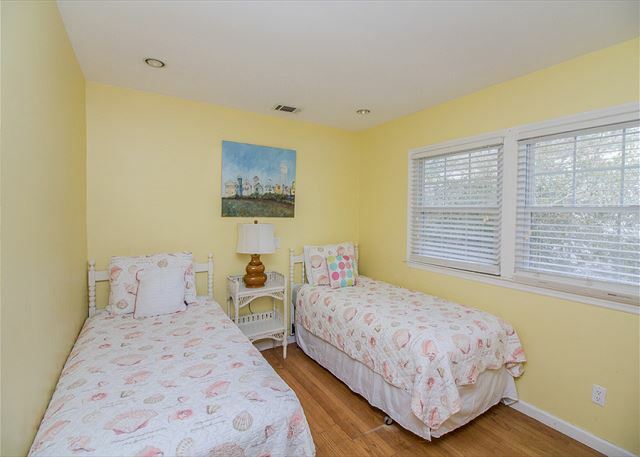 Pet-friendly (no fenced yard) with a wraparound porch where the cooling ocean breezes blow all year round. 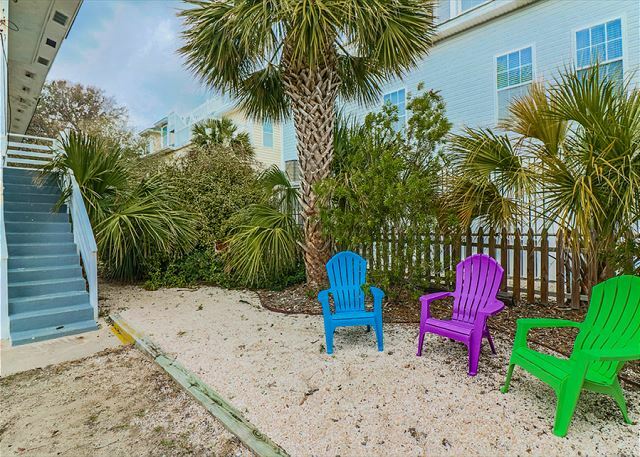 Complimentary WiFi allows you to stay connected, yet when you're looking at the south end of Tybee - you'll want to put that computer away! Filled with local art, lots of room to gather together as a family. Yet small enough for just a weekend getaway for two. Unique feature - a downstairs shower/bathroom and laundry area which is PERFECT for showering off the beach sand before heading inside! 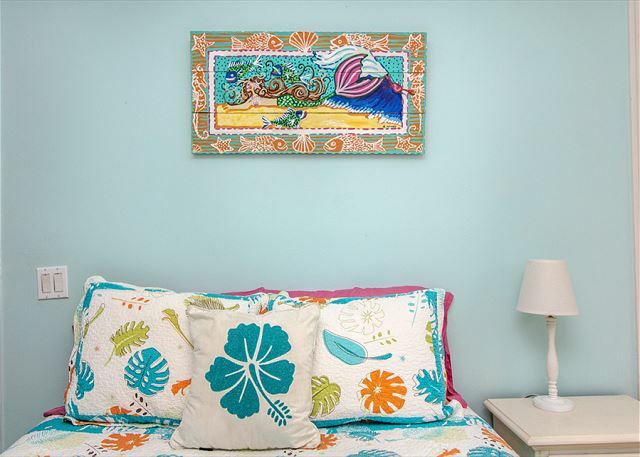 Fun, beach quotes painted throughout with bright, cheerful colors - let's you know you are on VACATION AT THE BEACH!!!! 18th Lane is a private lane and Atlantic 2 is almost at the very end of the lane. Atlantic 1 (formerly Doyle's on the Dunes) is the other home directly in front, so larger families can rent two homes to stay close (and close to the beach) but separate. 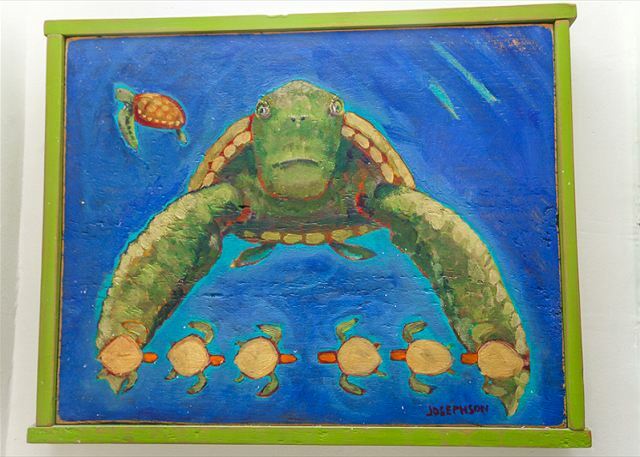 Don't forget our Sea Turtles!! 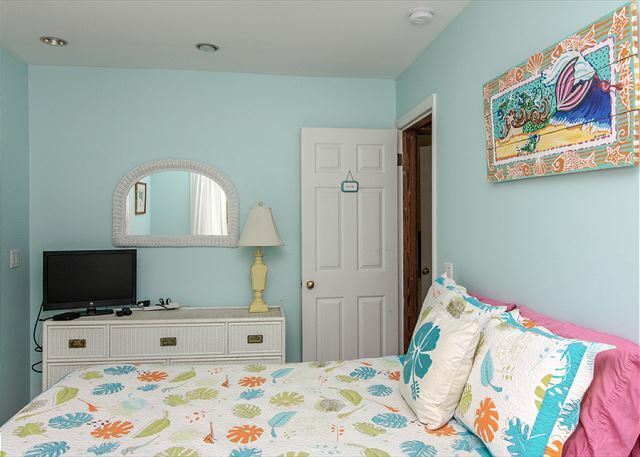 We have also been careful to make both these cottages "sea turtle friendly". We've installed the proper sea turtle lights and also want to be sure all our guests know "Lights out for sea turtles" from May 1st thru Oct 1st. Sea turtles need dark beaches to not only lay their eggs, but also when the babies hatch - they will go towards the brightest light. 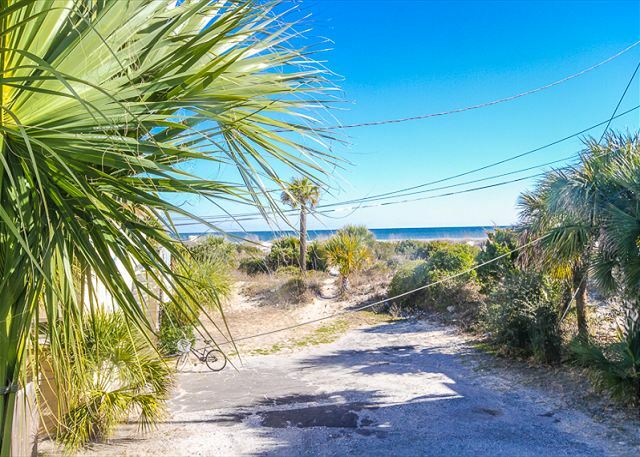 We want to be sure the brightest lights on Tybee is the ocean, not lights from the houses. 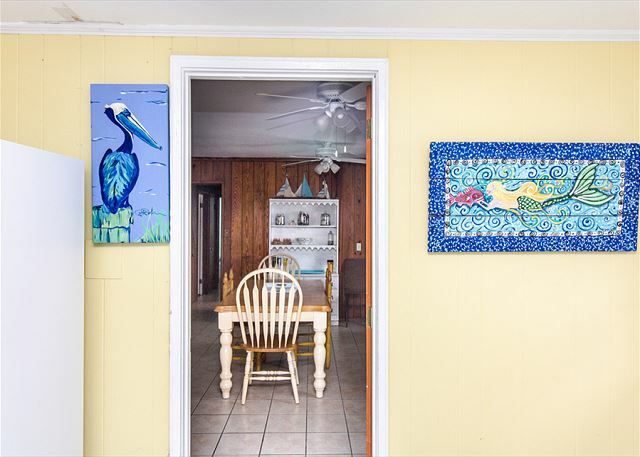 You will love this cottage and best of all your rental helps support sea turtle projects in Georgia! 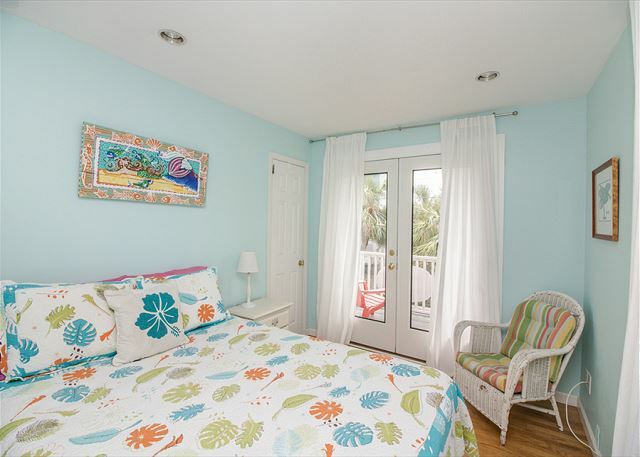 (1 in 3,000 sea turtles makes it to adulthood.....) This home rents up very quickly so make your reservation soon! 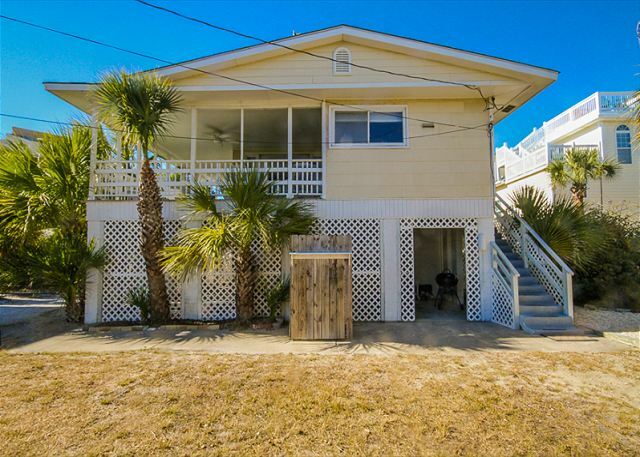 Great house, great location on Tybee. Pet friendly, which is so important to us. 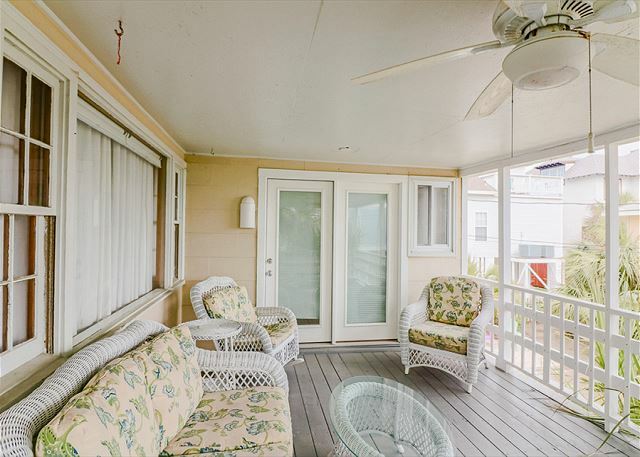 House has a fabulous porch for sitting outside to enjoy sea breezes and view of the ocean. Kitchen well equipped for those who like to cook. Clean, bright, well appointed, we had a very nice stay here. 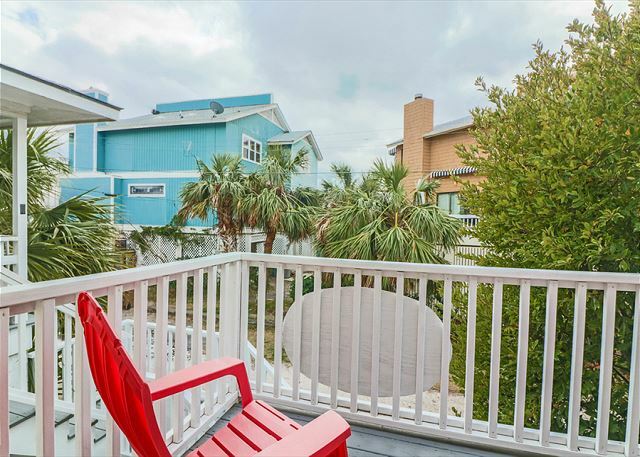 I loved the proximity to the beach (and at the best part of the beach on Tybee) and we all enjoyed the outdoor air while relaxing on the large porch, listening to the sound of the waves, watching storms, and drinking coffee on the sunny mornings. 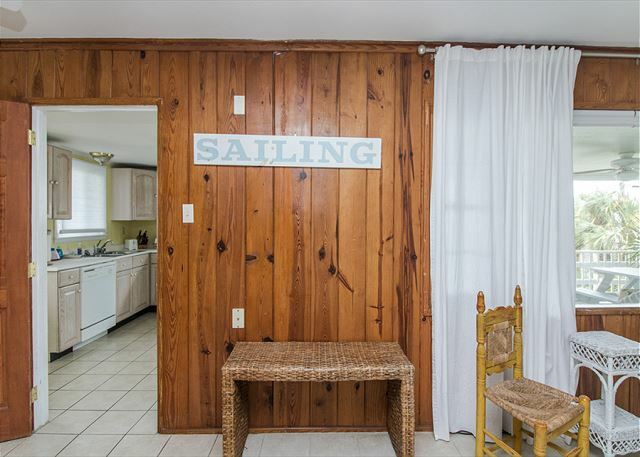 Fantastic cute, clean, well kept cottage, steps away from the water. Professional staff, excellent communication. Just a serene place to get away to. I can not express how much I appreciate the care and atmosphere of Atlantic 2. Location is amazing (though watch for venomous snake nesting grounds in the dunes!) Porch is perfect for breezy summer evenings and morning coffee! The home was clean and spacious. Everything that was needed was provided. Fabulous. View is outstanding. Upstairs very clean, bright. 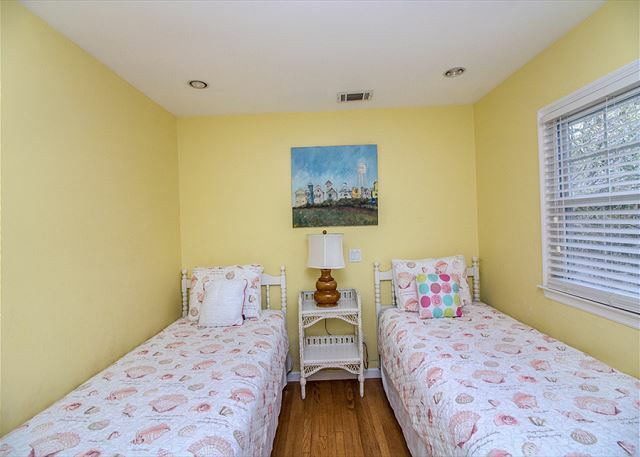 It is always a great stay with Mermaid Cottages!! 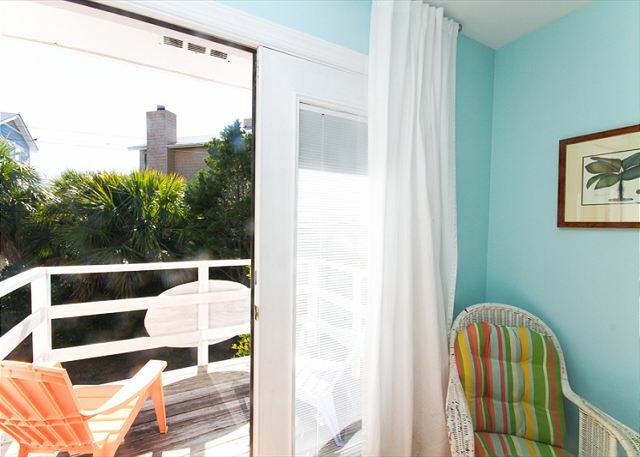 We absolutely loved this lovely vintage beach house! Location to the beach was awesome and walking distance to restaurants and bars but far enough not to hear late night party noise! We ate our way across the Island, 80East, Breakfast Club, The Deck, Stingrays to name a few! 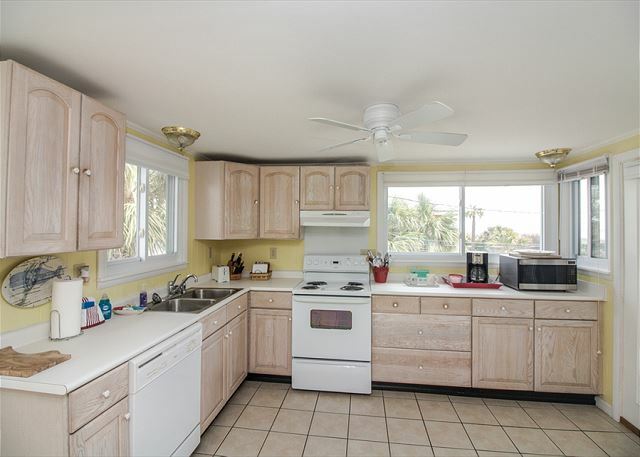 The full kitchen with everything you could need was helpful to have when not eating out. We each definitely want to rent this home again either with our own families or another girls trip! 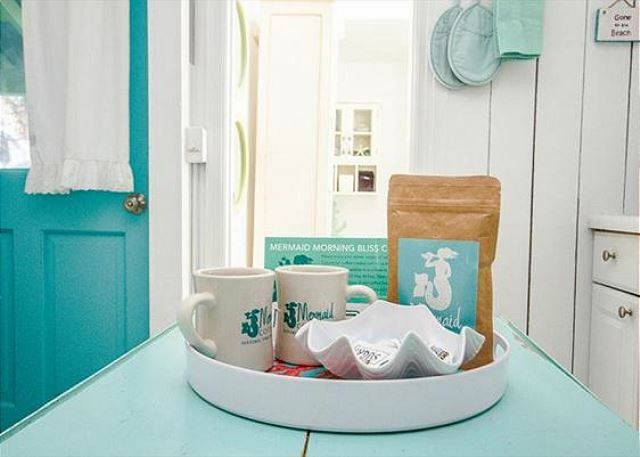 Only thing I did not get to was a visit to Seaside Sisters to get more Mermaid gear, love the coffee cups! Thank you to Mermaid Denise for taking care of us! This was such a great little house for our family with small children. Everyone had plenty of space & the house had everything we needed to make a complete Thanksgiving meal. A business trip turned family vacation and viewing of the Total Eclipse (8-21-17) came together because this great cottage was available. The Mermaid Cottage ladies were very personable from my initial phone call to reserve to the "check-up" voice mail they left to make sure all was well. We especially enjoyed the close beach access and the ocean view from the porch. While the access to the beach during high tide was a little tricky, we had absolutely the best low tide experience ever (we frequent the beaches SC, NC, and VA, lots of little sea creatures in the tidal pools. We love that Savannah is only 30 minutes away and spent a day there enjoying the history and beauty. The cottage was comfortable and clean and was well equipped, except for the lack of floor mats/rugs at entries. Do your grocery shopping off the island as the IGA is a dump! We ate dinner at Crab Shack which is quite an experience, only go if you like low country boiled seafood. We highly recommend Paula Deen's Creek House just off the island! Great atmosphere and everything we had was delicious (best fried green tomatoes I've ever tasted!)! 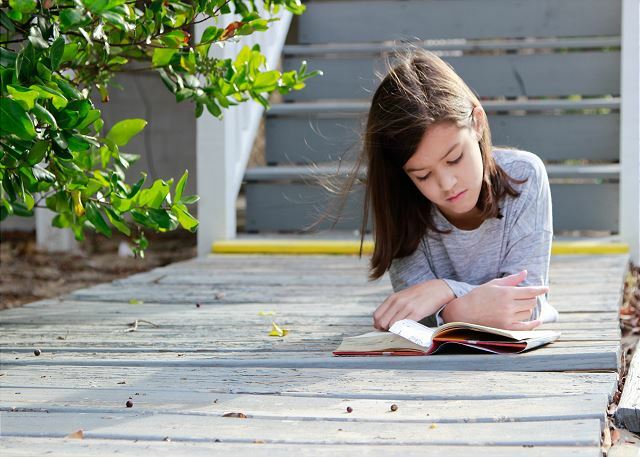 If you enjoy history, don't miss a visit to the Tybee Light Station. 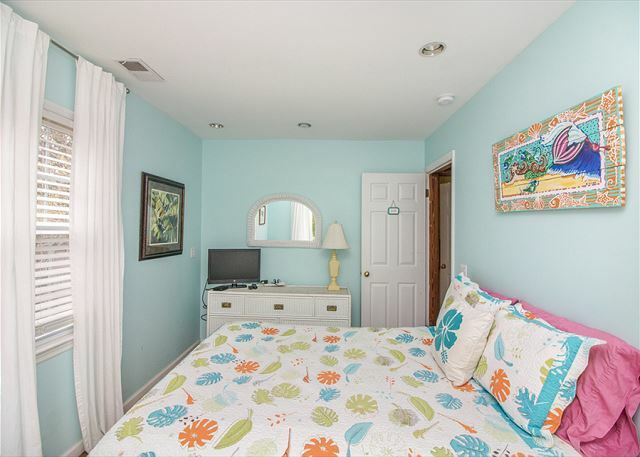 If we are down in GA again we would easily choose to stay on Tybee and definitely choose a Mermaid Cottage! We had a wonderful time at Tybee Island. Mermaid Cottages made sure we were happy and comfortable in our rental home. Thank you, we will be back next year. Another great stay with Mermaid! We have now stayed in two Mermaid cottages, Atlantic Two and The Shrimp,and each stay was wonderful. The mermaids went above and beyond to ensure we had everything we needed, the cottages were super clean and comfortable, and we we received some wonderful restaurant recommendations, too! Looking Forward to Tybee AGAIN!!!! Air conditioning out when we arrived on Saturday. Cable went out Wednesday and was not repaired when we left on Sunday. So sorry for those issues Cathy! As hard as we try sometimes the Mermaids get their fins stumped when it comes to these things we don't have full control over. 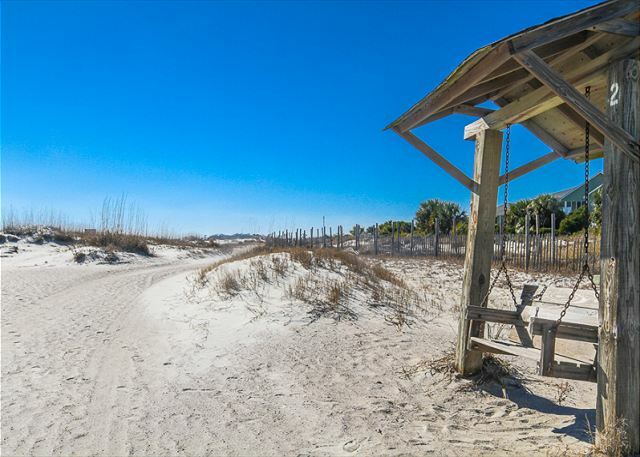 Hopefully that beautiful oceanview and quick beach access made your Tybee time enjoyable!! See ya next time and don't forget to call Mermaid Denise to get you all set, your Mermaid family. This place was amazing. The location was perfect. 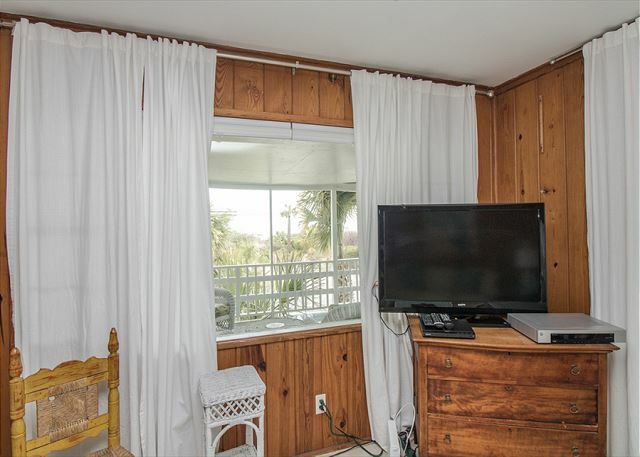 Ocean breezes everyday, plus an ocean view. Can't ask for anything more! A short weekend at the beach and Mermaid cottages again delivered a winner! Lovely cottage very close to the beach. Perfect size for a mom and three teens. Clean, comfortable and the wrap around porch is just perfect. 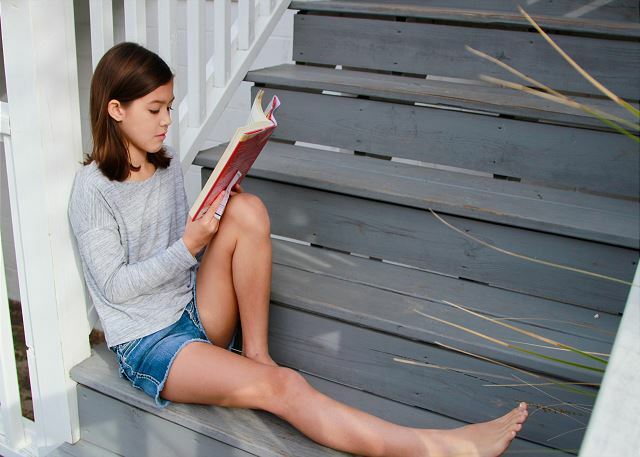 My 10 year old daughter and I took our 1st vacation-a roadtrip from Green Bay WI to Tybee Island. I'd never even heard of this place; was mainly looking for the shortest distance we could drive to the ocean where it would possibly be warm enough to enjoy the beach and not crazy with spring break college kids..I splurged on this cottage because of the incredible view of the ocean and palms..rolled the dice and drove on down. Everything was PERFECT. The island itself, as well as the cottage, is so laid back. Everything we needed was there and the views are even better than they look online. The breeze from the ocean is so nice. We spent countless hours just lounging on that gorgeous porch, having dinner there and watching the sunrise. We even swam in the (admittedly cold..but we're used to Lake Michigan) ocean on our last day. We loved the cottage and Tybee so much we added another day..and then added a second extra day! Couldn't more highly recommend!! 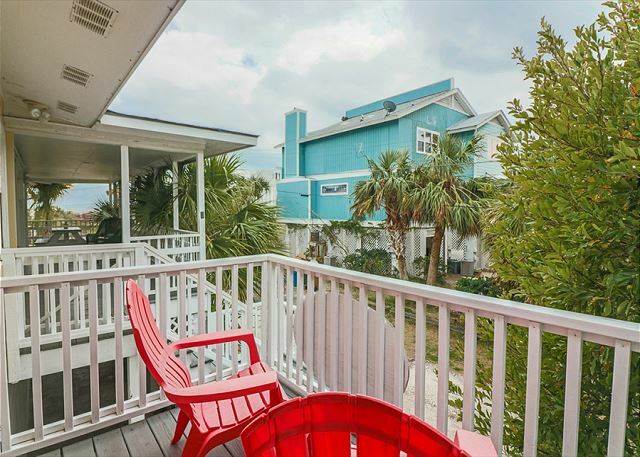 Great, beautiful location, nicely curated home, cozy and quiet part of Tybee, but close enough to walk to downtown and the pier. Would love to go back and would highly recommend to a friend. We had an absolutely wonderful stay at Crabby Jo's. The rental was clean, comfortable, and had everything we needed. It was close to the beach and even had a view of the surf. We wanted to literally live on the porch! Restaurants, shops, and the museum were easily within walking distance. We watched kite surfers daily and saw some phosphorescence at night! A little disappointed that we didn't get to see any sea turtles hatch...just bad timing I guess. We were very upset to hear that Crabby Jo's will be torn down in order to put up a fancier structure. 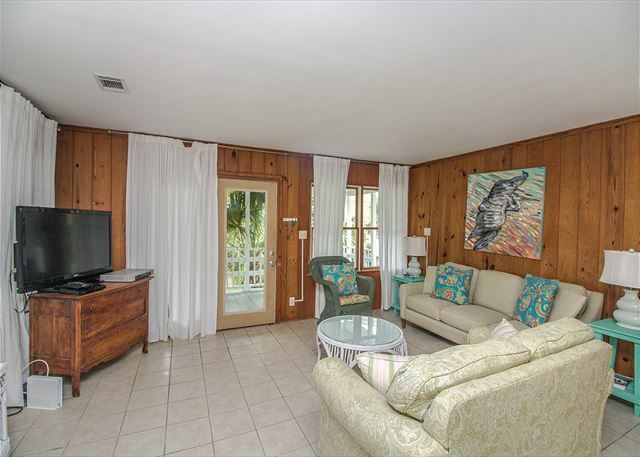 We loved the quaint beach feel of this 1930's home. We arrived to a clean, cozy cabin that was perfect for our group of 5 gals. 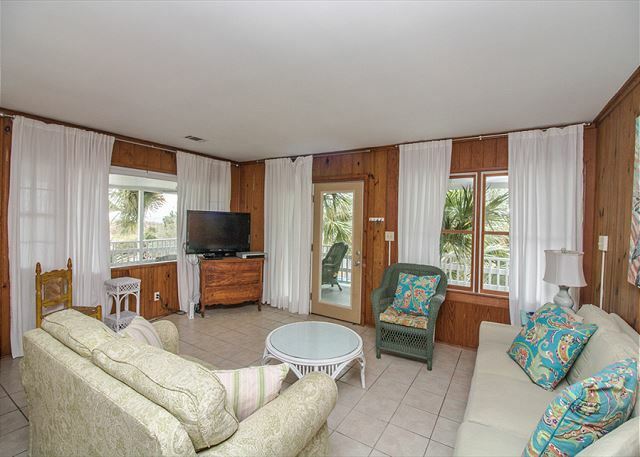 We enjoyed the covered patio and close proximity to shops and beach. Highlights were trips into Savannah, shell collecting, picture taking and simply relaxing with the wonderful mermaid coffee on the deck. What a great time. Awesome Vacation at Crabby Joes! 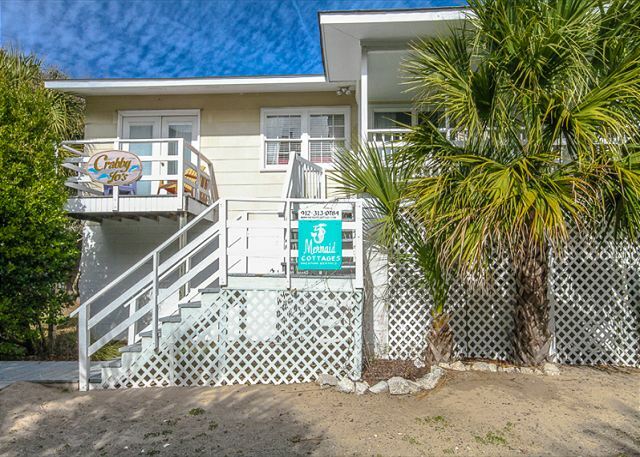 We had a wonderful vacation at Crabby Joes and I highly recommend this house for the location (so close to the beach) and all of the amenities. We really enjoyed the covered porch, large kitchen and showers downstairs to hose off all of the sand. Staff was attentive and helpful. We will be back! 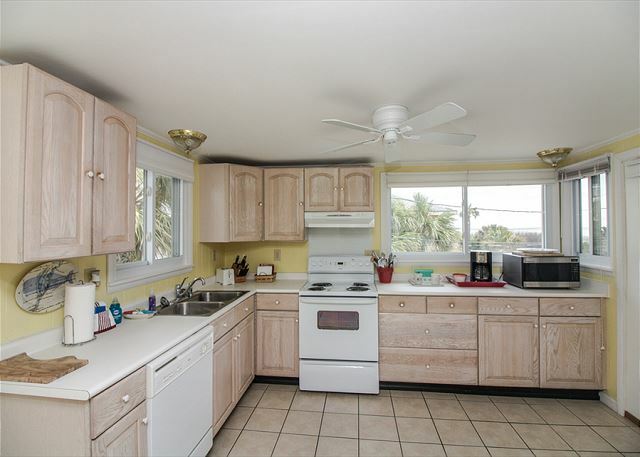 Love the property overall, access to beach, etc. 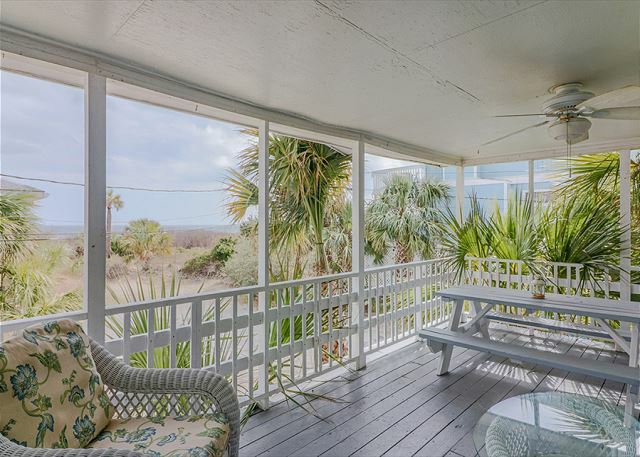 Especially love that porch with the ocean view! Outside of house appears to need some maintenance. Queen bed in yellow room needs work - probably a new mattress and frame. Incredible location with views/easy access to ocean, pet friendly w a lockable gate on the wrap-around porch, ample room for 3 adults/2 dogs, well-stocked kitchen, great restaurants nearby. We did NOT want to leave and will definitely return. Guest services consierge made us feel very well cared for with offerings to assist in any way. Highly recommend Tybee Island Fish Camp and Sundae's for wonderfully prepared meals! The location and cottage were great. Cottage was very beachy. We had a week long family reunion with each family having their own cottage. It was the first time all had been together for Thanksgiving in decades. This was our 4th stay at Crabby Jo's and we are signed up for #5. My husband and I love everything about it. The location is so ideal. We actually enjoy a couple rainy days as we love sitting on the porch looking at the ocean and the weather. We 100% recommend Mermaid Cottages. They are the best. They respond within minutes if you need anything (not that we ever need much). 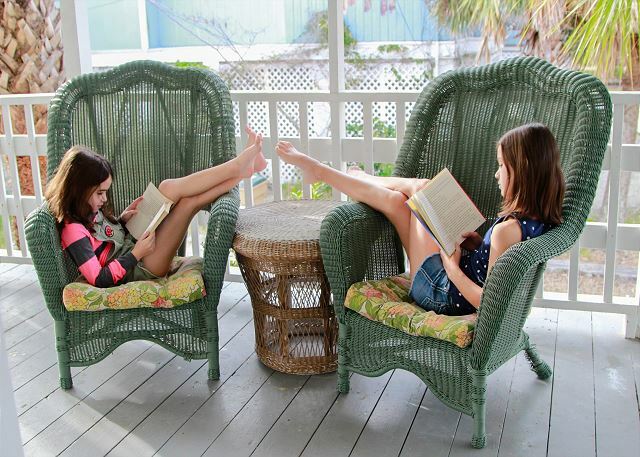 We can't wait to get back to Tybee, Crabby Jo's and Mermaid Cottages. We stayed at Crabby Jo's Beach House and it was wonderful! It was our 4th year at this house, and so close to the beach! 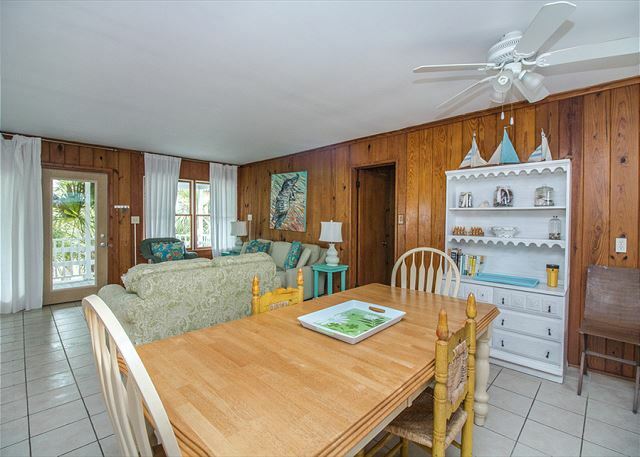 We love the wraparound porch with the beach view and the house is always so clean inside. We will definitely come back again next year. The much needed Tybee Trip! Spent a long weekend in The Mermaids Crabby Jo's cottage and fell in love with it. 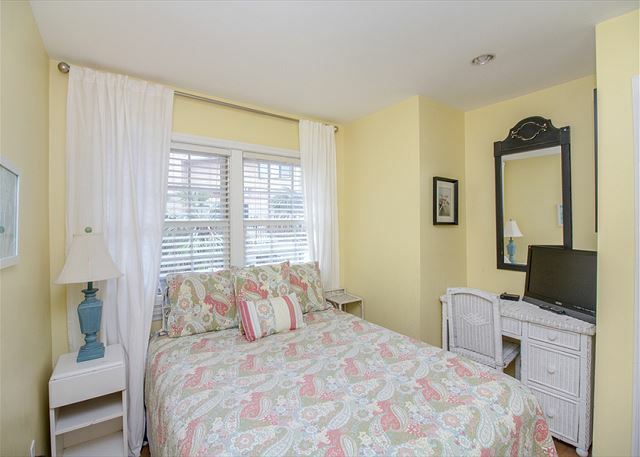 The cottage had a perfect beachy look (the fish quilt on my bed was adorable!) and a nice homey feel. It was so comfortable and just perfect for our sister/cousins girl trip. The kitchen was bright and cheery and very well stocked. An absolutely perfect covered porch, and since it did rain everyday on us (thanks to Erika) the covered porch was our favorite place to be. And we had a beautiful ocean view that was just what we needed. The sight, sound and smell of the ocean is just good for the soul. Normally the 2nd bath in the basement wouldn't have been an issue at all, but with the heavy rain and having to go outside to get downstairs, it wasn't as convenient. Can't say enough about the awesome service we got from Mermaid L. We couldn't get our remote to work (operator error)and she had someone out there in 10 minutes to show us how. The whole Mermaid crew was incredible! Will definitely be back to Crabby Jo's! 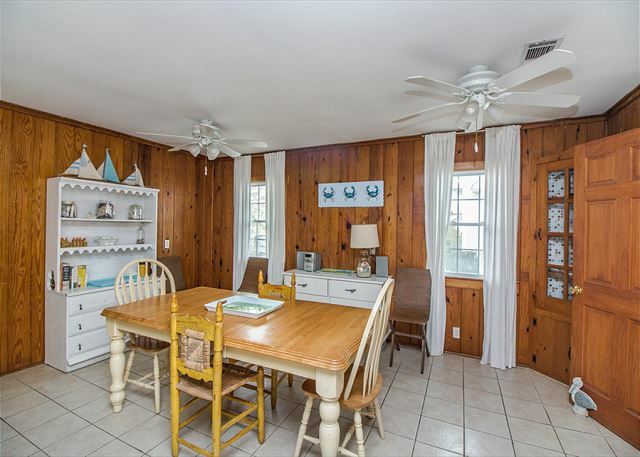 Wonderful vintage cottage with ocean view and great covered porch! This was a perfect vacation spot! Great view, walking distance to shops and food. 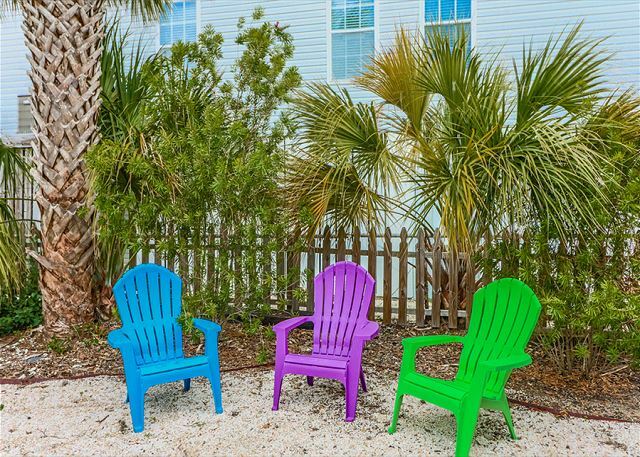 Anytime we come to Tybee we will rent from Mermaid cottages. They are SO helpful and their houses are always extra clean. Thanks for making our stay here amazing!!! We had a Blessed Time here. We stayed at Craby Jo's last year and it was Amazing. Very clean and everyone with the Mermaid Cottages was so acomanding. 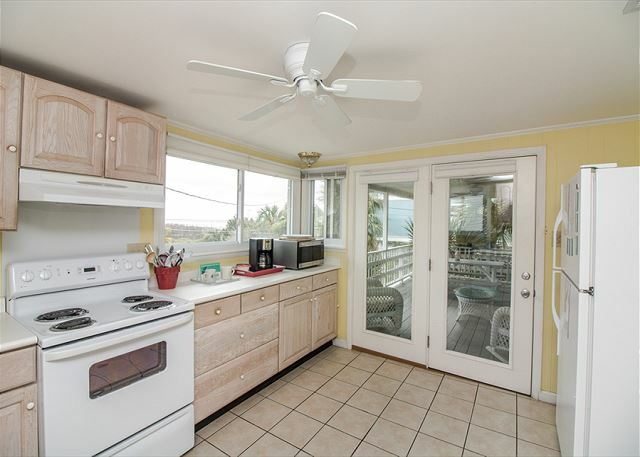 My husband is disable so he really enjoyed the porch with the Ocean view and sound.Wonderful kitchen with everything we neded. Thank You Mermaid Cottages for the wonderful service and opportunity to enjoy this incredible vacation home. Crabby Jo's was the perfect spot for our weekend away with the girls. The location was perfect and the cottage was cozy with a gorgeous porch. The amenities of the house were exactly what we needed. This cottage was like going back in time. The location was the best I have ever know for relaxing and overall beach enjoyment. Sweet!! 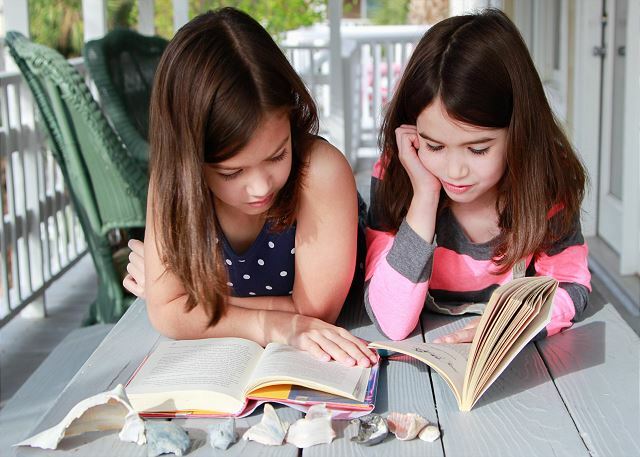 From the minute we arrived at Mermaid Cottages in Tybee Island, we felt welcome. The cottage was very clean and well equipped with anything we needed. A phone call welcomed us and Heather and Daryl stopped by to see if we needed anything. We especially enjoyed our view from the porch. One suggestion for safety is that the bathtub is very slippery and needs a mat or strips so that it is safe. Thank you so much for a wonderful 10 days in Tybee. Great week at Tybee--south end of the island was great with huge tidal pools for kids to play in. Walk to the beach was just 100 yards and view from the porch was great with awesome ocean breeze. Being on a private drive was nice and we barely saw any neighbors the entire week so it was a great vacation for our family with two small children. The four of us spent 3 nights on the Island at this quaint cottage by the sea. It was splendid! 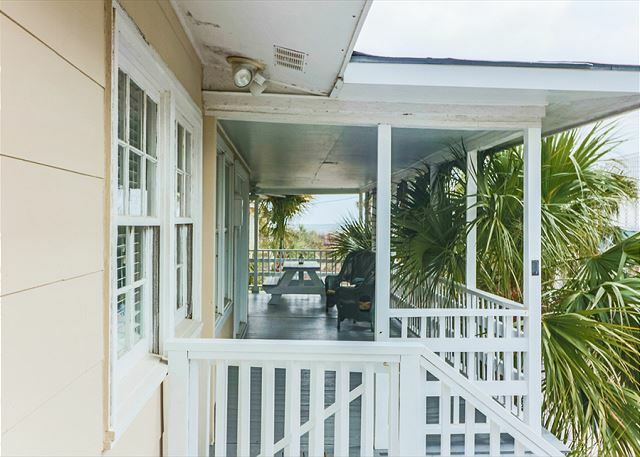 The view from the porch, the short walk to the beach, and all the conveniences of the renovated and thoughtfully stocked home are the best. 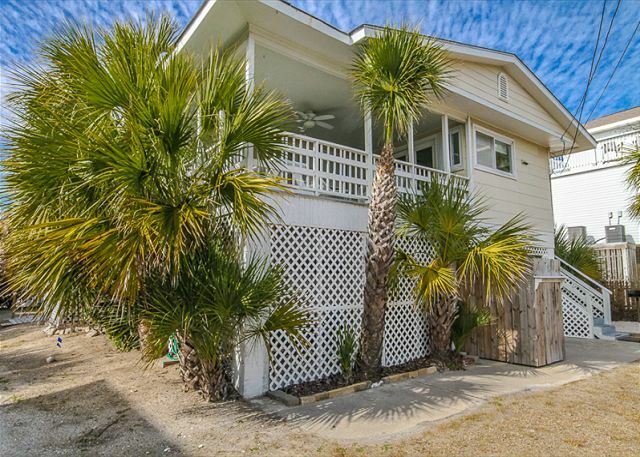 This is the third vacation rental we have experienced on Tybee. We have the same complaint every time....we had to leave! Thank you, Mermaids. See You Again. We went to Tybee to celebrate our family birthdays in February. It was a nice relaxing 4 days. The house was well equip, clean, great location and the management company was professional and more than helpful with making sure we had everything we needed. Great company to rent from and great house for a visit to the beach in winter or summer! We had a fantastic weekend at crabby joes. Everything was perfect. Special thanks to Jan and Tammy who made our stay so comfortable. Crabby Jo's - Great Location! This was our third stay at Crabby Jo's and we are already signed up for next year. This cottage has such a fabulous location - great ocean views and easy walk to the beach. The Mermaids are the best. Diane has created a wonderful organization with outstanding people who really want you to have a perfect time on Tybee. I loved the great covered porch that wrapped around the cottage. This made my reading very pleasant since I was in the shade and could look up at any time and rest my eyes on the ocean view! What an amazing place. From location to welcome, Mermaid Cottages does not disappoint. 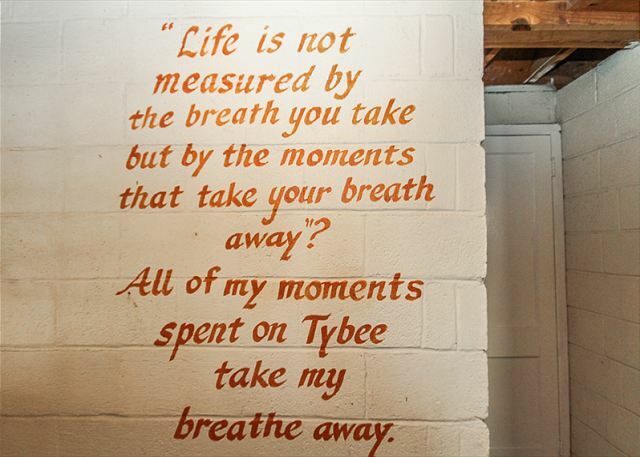 We went the Tuesday after Labor Day and if you are looking for peace and quiet, and a true getaway from the crowds, that is the time to go to Tybee! Crabby Joe's is right on the dunes and an extremely short walk to the beach. 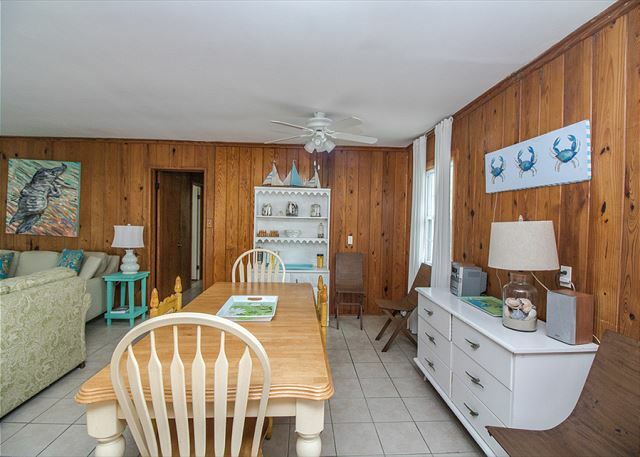 You are right on the southern curve of the island, far away from the boardwalk, but can take a beach side walk and easily be in town in minutes. Loved that we would just park at the property and were ale to walk EVERYWHERE. Pet friendly is an understatement at these properties. Our furry friends are welcomed and treated as tenants. Only bummer was that the beach does not allow pets, would've loved to let my dog out for a great run. Crabby Joe's has an amazing porch where you can have all of your meals. Kitchen is perfect. 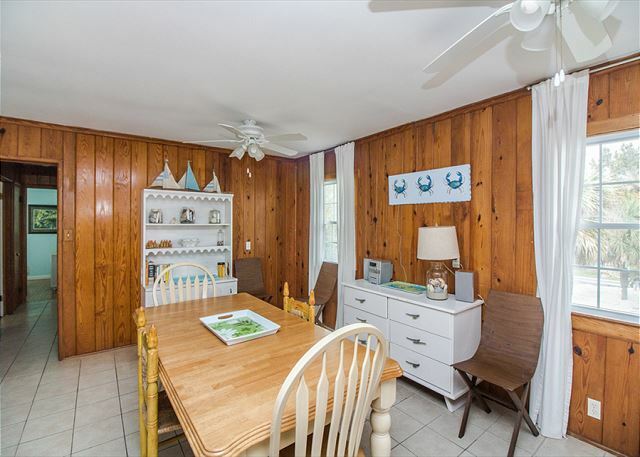 Family entertaining area is ample and wonderful. 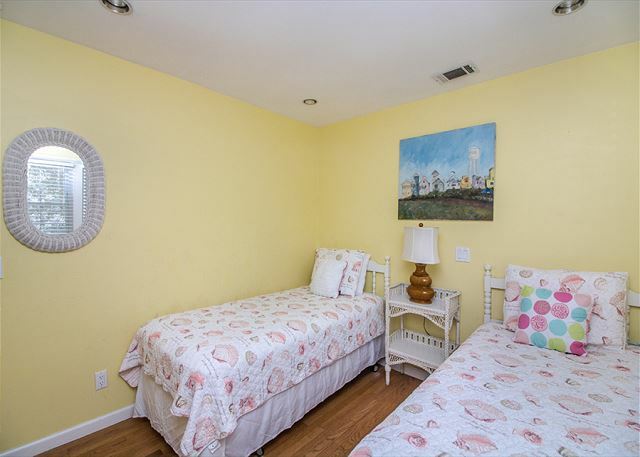 Bedrooms are a little close to each other- so make sure if you book Crabby Joe's that you go with your family. Privacy may be a bit of an issue if you book with friends and are multiple couples. 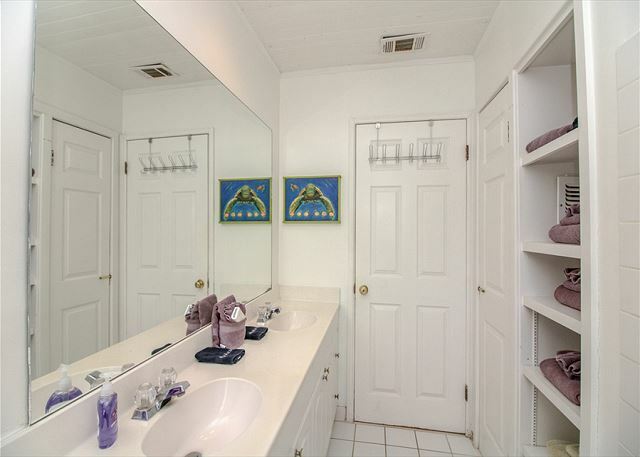 Ample bathroom with 2 sinks really made it easy to share. 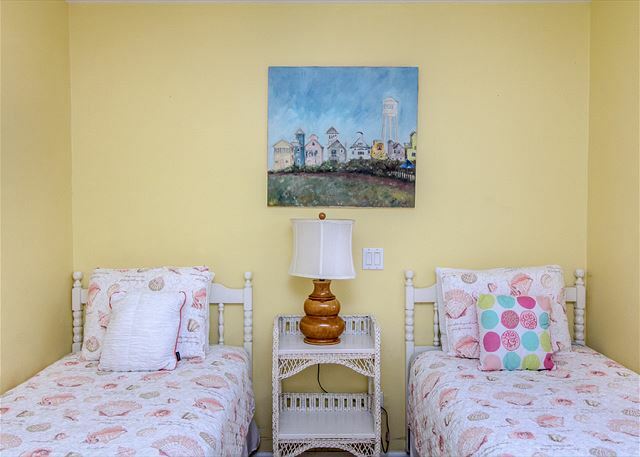 LOVE Mermaid Cottages Love Tybee Island! Crabby Jo's- A great beach getaway! 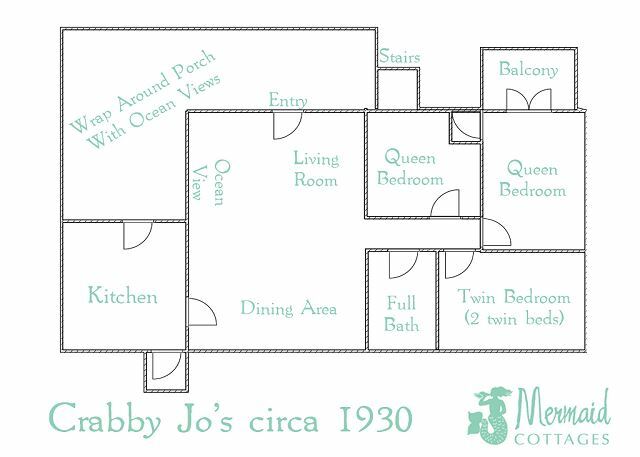 This is our third year at Crabby Jo's and our fifth year with Mermaid Cottages. Crabby Jo's is wonderful! 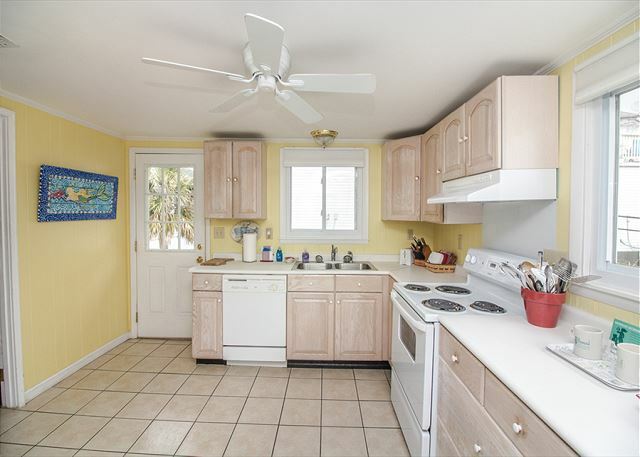 It has an ocean view from the house and terrific wrap around porch and the inside is immaculate and great for several couples to have their own privacy yet mingle with the group. 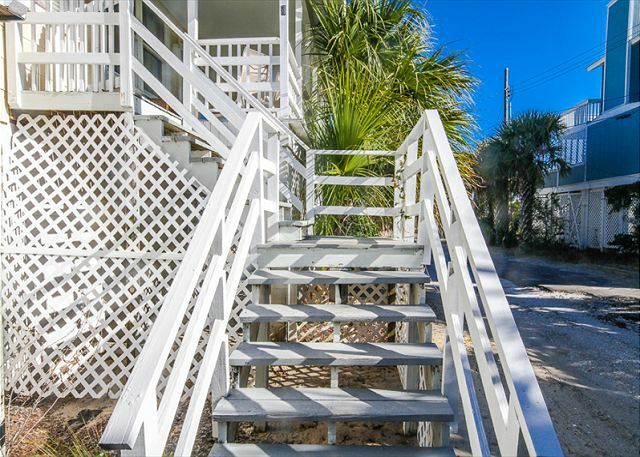 It is close enough to walk to downtown Tybee and the pier. We also rented a golf cart and rode around the island - this added to our enjoyment this year. I would recommend Crabby Jo's for a wonderful Tybee trip. The housekeepers, Heather and Daryl, were also terrific and did a great job. The house was amazing! You truly just needed to show up and enjoy the beach. They had everything ready for you and were so welcoming when we arrived. We thoroughly enjoyed our vacation on Tybee Island thanks to this wonderful home. IDEAL LOCATION! 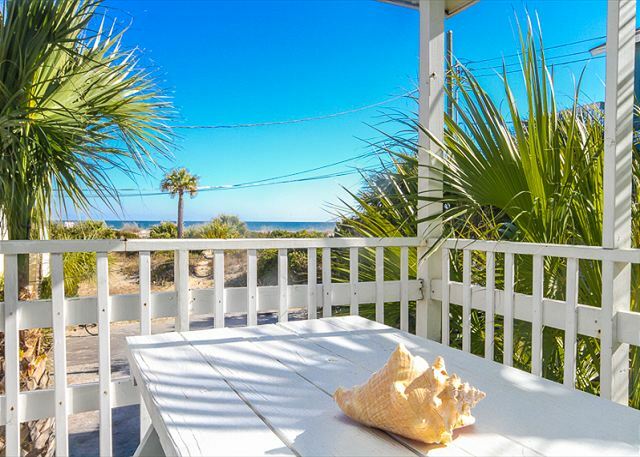 We loved being able to take a short path to the beach and the porch view is amazing. Thank you Mermaid Cottages! Crabby Jo's was a cozy beach cottage. Would definitely stay there again. We had another wonderful time at Crabby Joe's! This was our third year at this beautiful Mermaid Cottage and about the 17th year on Tybee. The cottage was clean, pleasant and ready for us. Kudos for adding another sofa! Perfect, comfortable seating inside and such a gorgeous view from the deck. We visited all our regular restaurants (Sting Rays, Flying Fish, Crab Shack, McElwees, and A. J's) and of course Sugar Shack for a sweet treat. This year we tried the new gelato at Sweetie Pie's and loved it as well. We rented bikes from Tim's and enjoyed our bike ride around the island. Already making plans for next year!! WOW - when we stepped onto the porch, we knew we had arrived at a special place. The views were stunning. The cottage was spotless. The kitchen was well appointed, loved the fresh ground coffee. The living area was comfortable, with a large TV. The bedrooms were beautifully decorated and the beds were very comfortable. The bathroom was spacious with plenty of big soft towels. Mermaid Carol was so wonderful to work with, she really went out of her way to make our vacation stress free. Thank you so much Carol. Tybee Island is a special place. Crabby Jo's is a special cottage. We are already dreaming of our next visit. A paradise for all. My husband has health issues and it was unreal how we could sit on the porch and hear the ocean and watch the waves day and night. It was music to our soul. Our Children and Friends enjoyed Savannah in the daytime and the Ocean after a long day of shopping and site seeing. 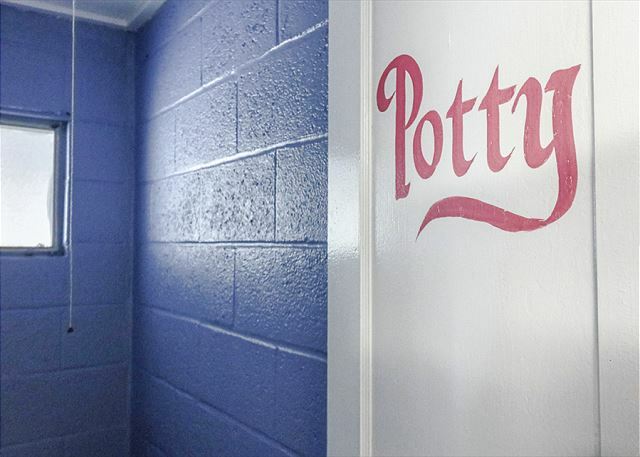 Loved the home so many convenient amenities. So nice to have breakfast on the porch and listen to the ocean. The Crab Shack has excellent seafood and close by. Extra nice to clean up downstairs after a day at the beach and not bring sand in the house or car. Can't say enough about this Cottage. This place was completely adorable, it had everything you need to have a wonderful vacation. The staff at mermaid cottages gave impeccable service! If only it hadn't rained all week life would have been a dream! 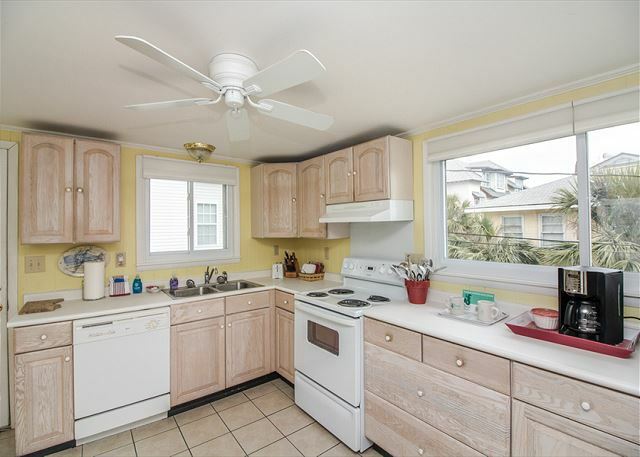 I would recommend this home for anyone who loves the beach. PS my dog would not eat the special dog treats provided for her and I would say that keeping our yellow lab off the beach was a challenge! We had a wonderful time, loved the cottage and location and would definitely stay again! Thank you so much for making our stay enjoyable! Very Peaceful. Everything was perfect. We are trying to determine when we can bring the whole family downn this summer. This one was just the wife and I. You Won't Be Crabby if You Stay at Crabby Jo's! It was near perfect; we hated to leave and can't wait till the next time! We absolutely enjoyed our stay and look forward to returning. It will be difficult for us to ever consider a 'luxury hotel' stay again after staying at Crabby Jo's. It was so much more relaxing and private than a hotel. We can't wait to try another Mermaid Cottage. Mom, myself & 2 sisters enjoyed 4 great days at Crabby Jos. You can't beat the location, tip end of south beach, far away from any crowds. There was plenty of room for walking or just sitting under the umbrella with a glass of wine. 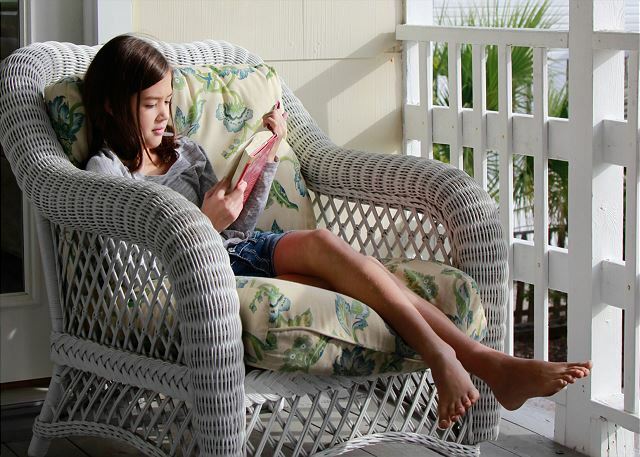 The porch offered plenty of sun cover, cool breezes, ocean views & a great spot for reading. Would have been nice to have a chaise for reclining. Rooms & beds were fine & plenty of hot water for 4 gals. We would certainly stay here again. AJ,s & Stingrays, both within walking distance, had great local seafood. it was a wonderful time for grandparents and granddaughter. The pathway to beach is a little difficult for seniors, maybe could be widened some and growth trimmed back. Mattress in Palm b'room should be replaced. Except for those 2 minor issues we had a terrific stay and would love to visit again in the future. The Staff were all exceptionally gracious and helpful. We have stayed at this cottage two years in a row and can't imagine staying anywhere else. Our only complaint is that the washing machine was out of order and we packed light expecting to be able to wash our clothes while we were there. The staff offered to have our clothes laundered for us (which wasn't an option with "personal" items). Would have been easier to allow access to the washing machine at the cottage next door. Aside from the washing machine situation we thoroughly enjoyed our stay. Wonderful Time in Tybee with all the right weather conditions. This was our second year as a guest at Crabby Jo's. The cottage is lovely with a great view of the ocean. Everything is in working order and very clean. 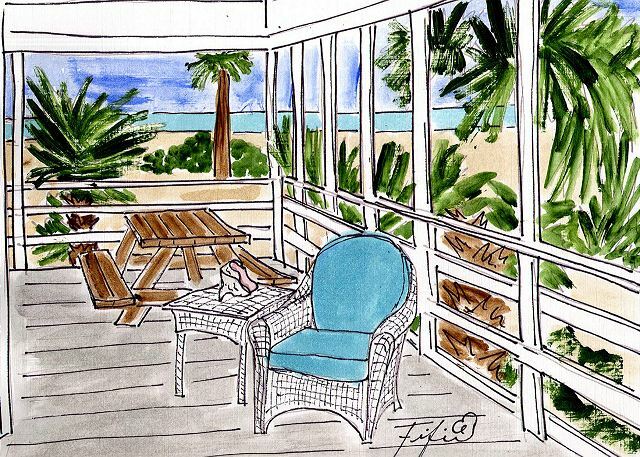 The covered porch overlooking the beach is a real plus, a beautiful place to read a book and catch the view. I did a walking tour in historic Savannah the day before we left. It was really entertaining and fun, lead by Savannah Dan. Check out his brochure at the visitor's center. We just love Crabby Jo's and we love Tybee. This was our second stay at Crabby Jo's and it was wonderful! The house was perfect, clean, wonderful location, and I don't know anything that I would change. We will be coming back next year. We have stayed at several Mermaid Cottages over the years and this is our favorite one! The view from the porch and kitchen window of the ocean are fantastic! Thank you, Mermaid Cottages, for another great vacation! Crabby Jos offers everything one would need for a fabulous vintage Tybee vacation. It is great for a small family with pets. 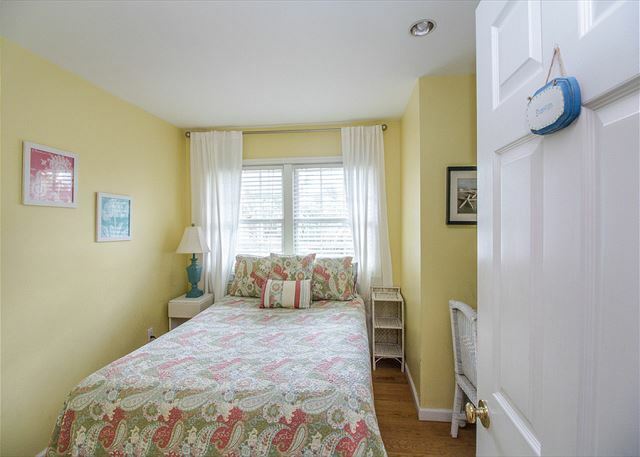 Location is nice as far as proximity to the ocean and downtown fun. Our three year old son and our dogs enjoyed the spacious and comfortable porch. Would definatly come back to crabby jos again. Rain or shine you have great view of the beach! 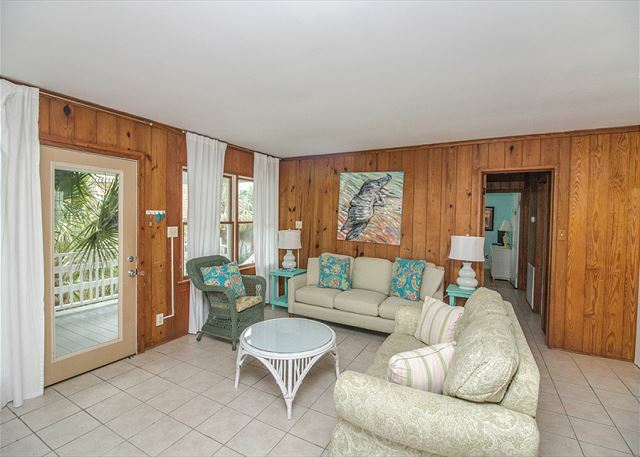 Vintage wicker inside and a nice wrap around porch outside make this vintage beach house a great place to stay! Mermaid Cottages is the best! This property is great and can't wait to return! We absolutly loved our stay at Crabby Joe's. The location was perferct. We loved be secluded from all the condos and hotels on the private lane. The porch was our favorite feature and spend most of our time on it. 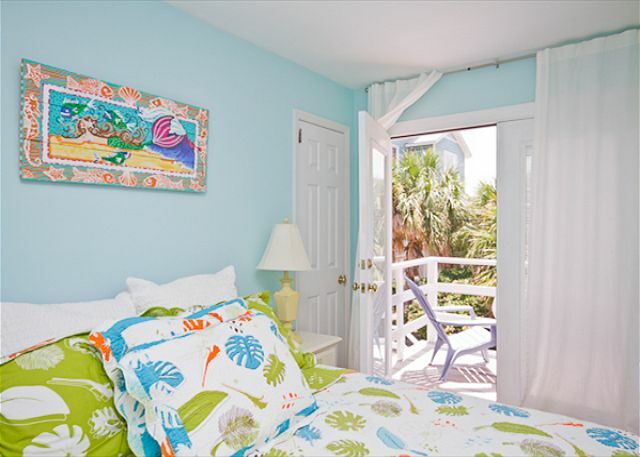 When we return and we will, we will always want to stay at Crabby Joe's! Thanks Mermaid Cottages for a great place to stay! Had a lovely, relaxing time at Crabby Jo's. When my only complaint is that the living room chairs weren't too comfortable, I'd say I have very little to complain about. Very clean, everything we could need at our fingertips. 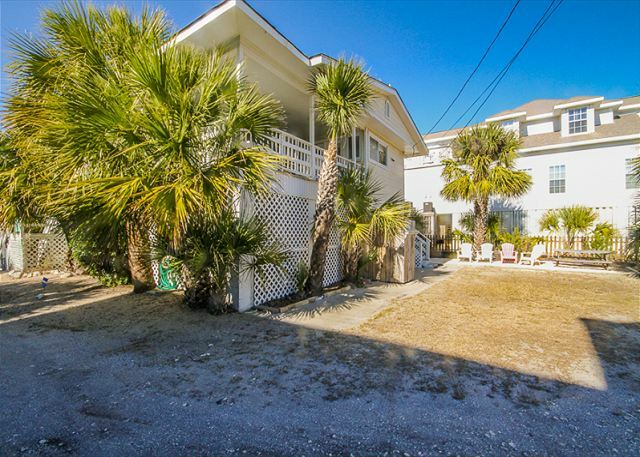 Very easy to rent, find, relax and enjoy our trip to Tybee. The property was overall very good. 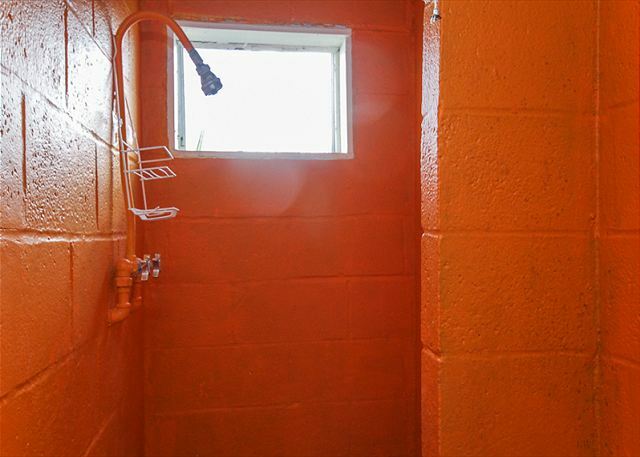 The shower and laundry facilities in the basement were not as easily accessed as they appeared. The jack hammering on a new property in the vicinity was somewhat irritating. 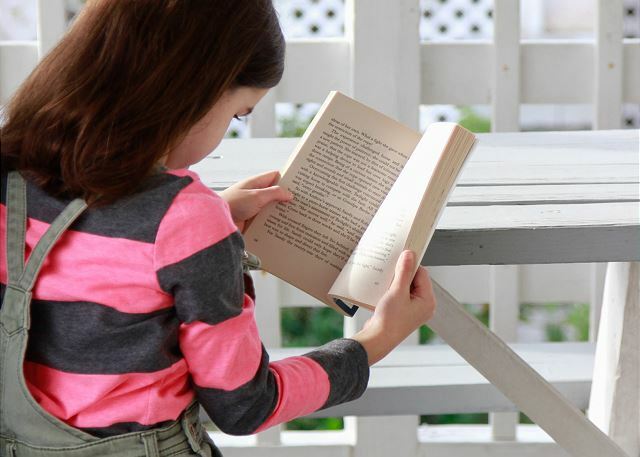 It made us want to stay inside instead of sitting outside on the lovely porch. Had a very enjoyable time at Crabby Jo's. We will use Mermaid Cottages again! Good location, good condition. The management company is very professional and detailed. 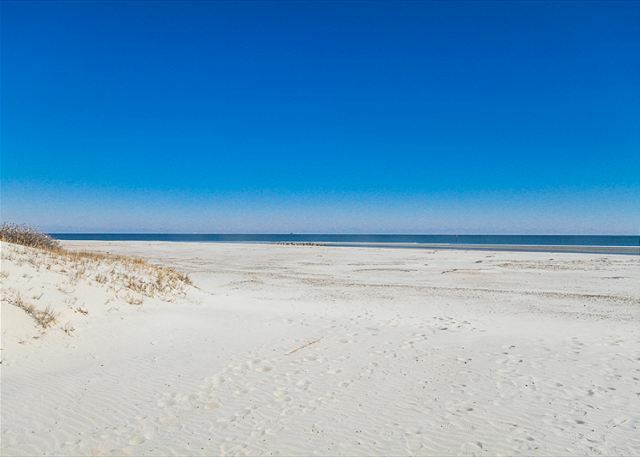 We had never been to Tybee Osland, but now we are hooked! 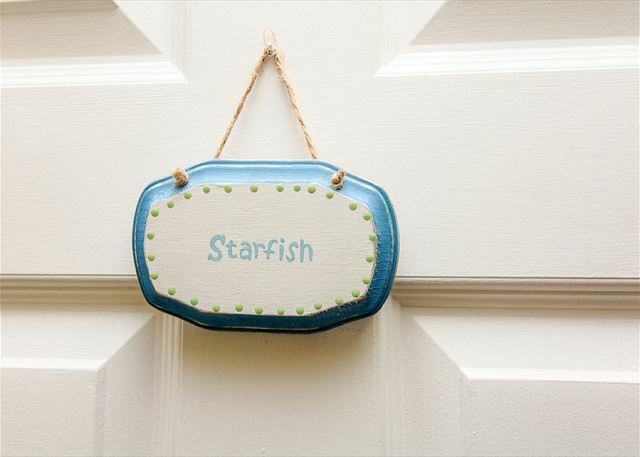 Thanks to mermaid cottages and Crabby Jos. Can't wait to come back! We had another great stay at Crabby Joe's! The house is cute and immaculate, with a breath-taking view of the ocean. This is our second year in this rental and our 15th to Tybee and each year gets even better. We would highly recommend the Mermaids and Crabby Joe's!! Easy on-line reservation process and hassle-free check in and out. Crabby Jo's was a perfect weekend get-away in May. Second house back from the beach, but great view from the large porch. Plenty of parking. Walking distance to shops, restaurants, bars, pier. Next time, will plan a longer stay. 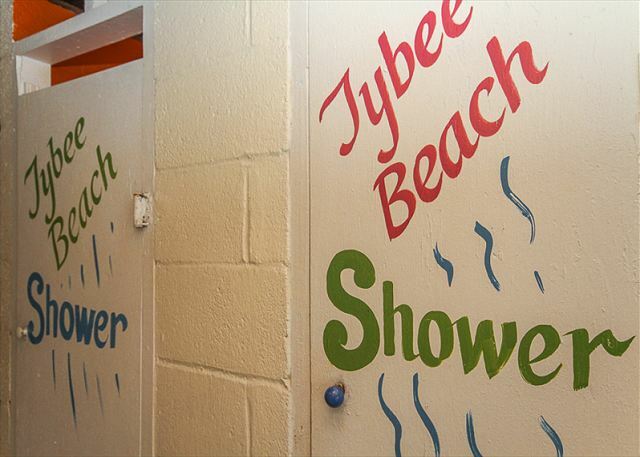 I don't think you can go wrong entrusting the Mermaids with your visit to Tybee. Excellent service. Mermaid Cottages has always been all they profess and more...look forward to staying, hate to leave!!! Cottages are so cheerful and so is the staff, the staff keeps you updated on all the local happenings which I love!!! I have never had an issue ever although I do believe Crabbys is my favorite cottage now..
We love coming to Crabby Jo's when we visit our daughter who is a student at SCAD. 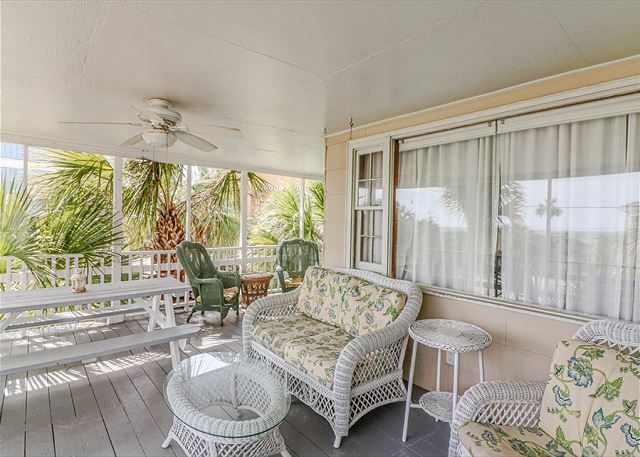 It's the perfect location with a beautiful ocean view from the porch and a short walk over the dune to the beach. Most of our time is spent on the enclosed porch which is great for our dog as well. This was our second visit to Crabby Jo's and we hope to return next year. We miss you already! We had a wonderful stay and hope to be back real soon! Crabby Jo's is a perfect balance of cool old beach house with modern comfort and the Mermaids' attention to detail is beyond measure. My husband and I just spent 17 glorious days at Crabby Jo's. This was our 5th visit to Tybee but our first with Mermaid Cottages. Our entire experience was perfect. 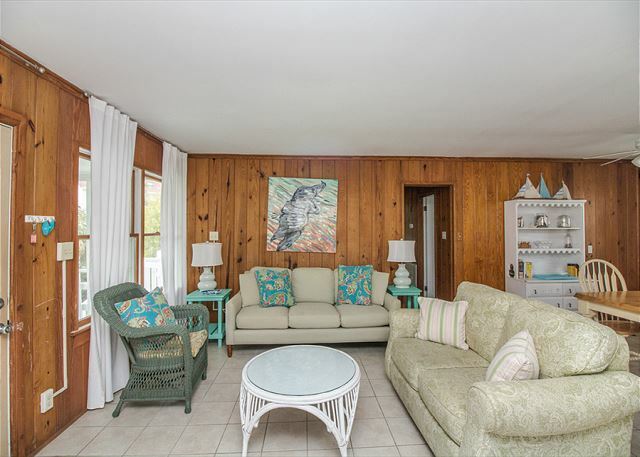 You simply cannot beat the location with a wonderful ocean view and steps to the beach which gives you both the waves on the ocean and easy steps to the beautiful Back River area. You can see the sunrise from your windows at Crabby Jo's and take just a few steps to see the sunset over the Back River. Mermaid Cottages provides terrific customer service. We didn't need much but they responded immediately for the few things we asked for. We were warned that there was house construction nearby. This turned out to be no problem at all. Yes, there was construction activity for 5 days but it was in no way a problem or even an annoyance. I am so glad that we did not cancel because of this. We have already signed up to return next October. Can't wait! Wonderful time! Crabby Jo's is a great place for a family. Would definitely stay here again! This was a great house! Although it has only one bathroom, there are 2 showers and a potty downstairs, so it was not a problem. The view was wonderful! And it is so close to the beach, no long walks or drives. The only thing that we had trouble with were the two outside door locks and the bathroom lock. None of them worked very well and had to be fiddled with for a while to get them to lock or unlock. The house is very very clean and large and open and has lots of windows. The huge outdoor porch was our main family spot to gather. We definitely want to return to this house next year! We stayed here the last week of August. Very nice and a great location. Listening to the surf crash and watching the waves was very relaxing. The kitchen had everything we needed, local restaurants were very good (both the dives and the high end) and people were friendly. 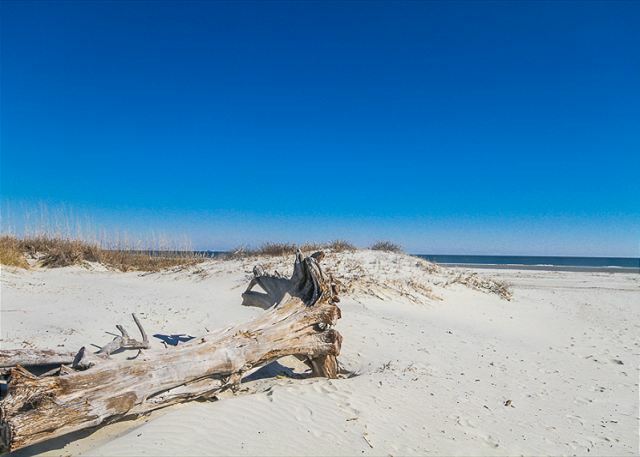 We had read some reviews on Tybee that were to the contrary and I am not sure where those statements were coming from, we never experienced any of that and we are not from the “South”, so we were tourists. We sat every morning and every evening enjoying the wrap-around porch. Mermaids were a great company to rent with and replied to every question we had. My family & I felt so comfortable at Crabby Jo's. The cottage is so charming, sunny, and tidy. It's beach view is beautiful. The Mermaids are friendly and helpful. We all felt so relaxed and well-cared for, making this vacation a favorite for all of us. 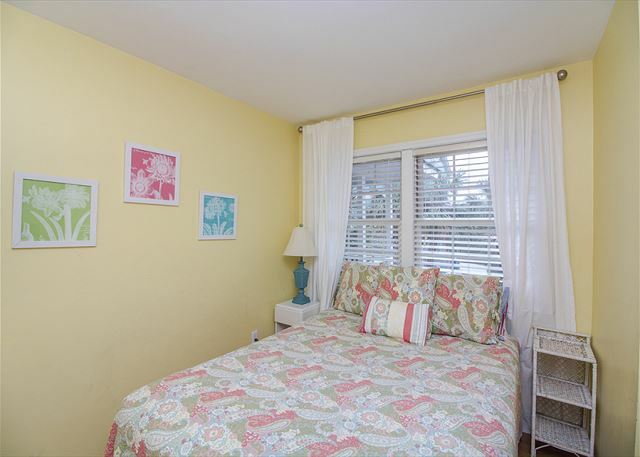 If you want to experience an old South beach vacation, then stay at one of the Mermaid Cottages. We rented Crabby Jo's and could not have been more pleased with our choice. The cottage was quaint, cozy, and close to the beach. It was large enough for our family of four and two dogs. The staff was very professional, and they went out of their way to make us feel welcome. We even received a call on our trip down informing us of a severe thunderstorm warning. I would recommend Crabby Jo's and Mermaid Cottages to anyone considering a Tybee Island vacation. able to just walk out the door to be right on the beach. The house was very nice and comfortable. We all hated to have to leave all this behind. 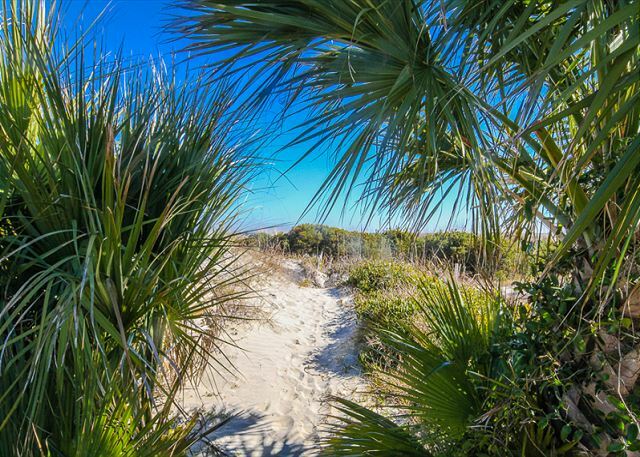 Savannah is a short drive, as well as Hilton Head. Which visited several times. Restaurants are close by, we especially enjoyed Crab Shack. Fun place for kids. Crabby Jo's was in a great location so close to the water, which made it really convenient with three small kids to just go back and forth all day long for naps and potty breaks. The house was wonderful, homey and spotless, and we had everything we needed and some things we didn't even know we needed! Would definitely recommend this property, and we hope to come back! Crabby Jo's and Mermaid Cottage rentals could not have been more efficient or enjoyable. The reservation, check in, condition, location, and check out where all flawless and friendly. Not one bad thing to say. We had the best time at Crabby Joe's on Tybee Island. The house had a wonderful location and was very clean and well maintained! The Mermaid staff was helpful and made our stay wonderful! We will return! Thank you! First time but not last time stay! 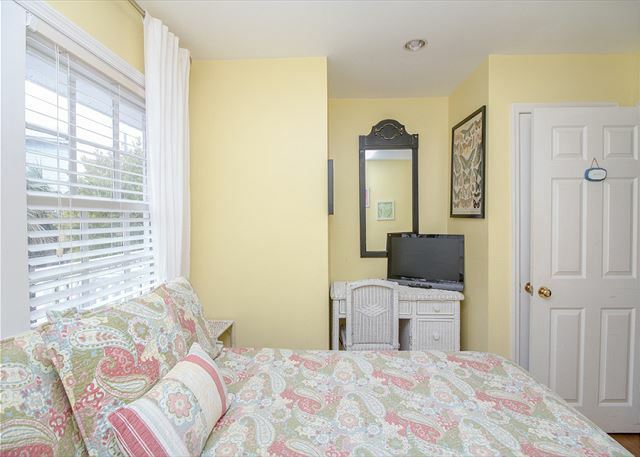 We've been visiting Tybee for the past twenty years and have stayed at various properties but this is our first stay in a Mermaid Cottage. It won't be our last and we've already booked Crabby Joe's for next year! The cottage was so cutely decorated and the ocean was just a few steps away from the beach. What a view!! Crabby Jo's is a great rental home. 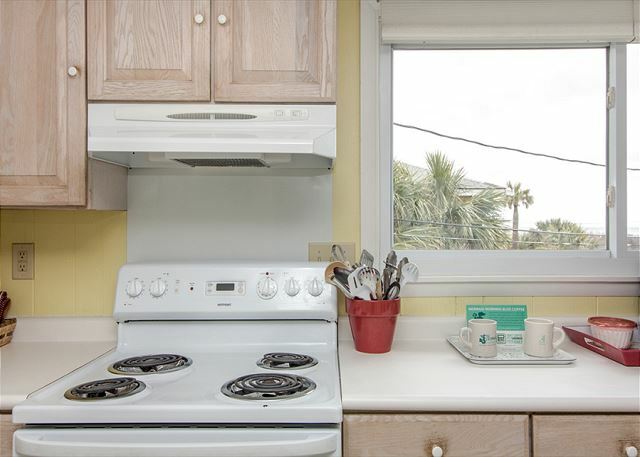 Spacious,clean, well-equipped, great view of the ocean. We have nothing bad to say about our experience at Crabby Jo's. The kitchen was large, had all the pots and pans, glasses and cups, plates and flatware we needed. The coffee they provided was great. The towels were thick and fluffy, and the beds were very comfortable. The house had cable and large TV's. The best part, though, was the wrap around deck where we could sit and enjoy watching the ocean while sipping our coffee in the morning and late afternoon. Within walking distance is the downtown district and several restaurants. Altogether, we had a great experience, and I recommend the house without hesitation. We went to Crabby Joes for a girls weekend and had the ABSOLUTE best time. The location, cute house, and awesome view made this a trip that we will never forget. The "Mermaid" staff also made it very special. They called in to check on us, gave us a flash light when a storm was coming (just in case! ), and had coffee waiting on us at the house. By far the best vacation in a while and we will definitley be back to Crabby Joes! Thank you Mermaids! Crabby Jo's is the perfect beach house! 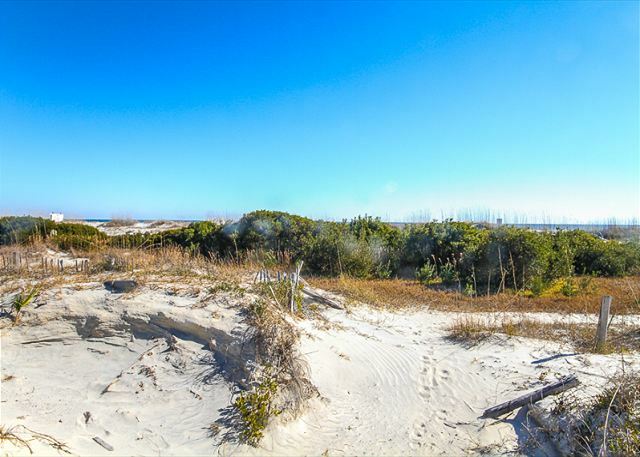 Quiet, safe and just a dune away from the beach. In the mornings, I'd fill my coffee mug and walk the beach, searching for shells and watch the sunrise in my pajamas! It was so peaceful.The house was adorable, comfortable and spotless. My sister and I instantly felt like we were living our seaside fantasy life! The mermaids have worked their magic paying special attention to detail such as the perfect pillows, soft linens and light, airy furnishings. Thank you, Magic Mermaids!! !